I've celebrated Christmas as a believer for over 20 years, and I don't think I've ever stopped to truly ponder the question, "What if Jesus had not come?" Have you? 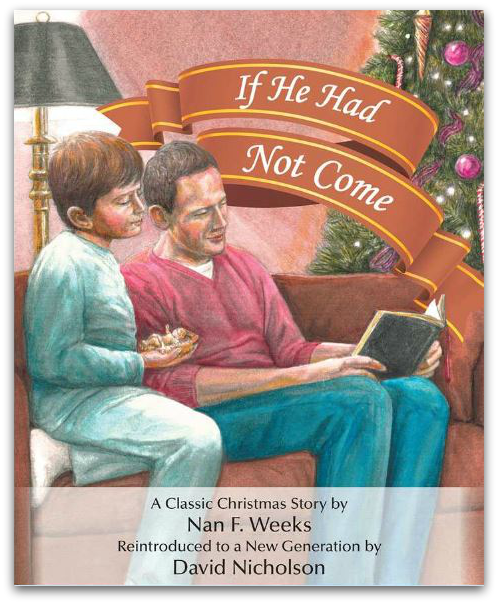 My family and I had a chance to think and talk about that question after reading If He Had Not Come, a heartwarming, classic Christmas story originally written by Nan F. Weeks and now reintroduced to a new generation by retired teacher and short term missionary, David Nicholson. Nan Weeks' story was originally published in 1938 in a literary collection, Christ and the Fine Arts, by Cynthia Maus. David Nicholson was captivated by Nan's story when he first heard it as a young adult in Sunday School, and starting with that very Christmas, it became a tradition for his family to read it every year. Almost thirty years later their tradition continues, and now others can begin the tradition, too! If He Had Not Come begins with a young boy named Bobby hanging up his stocking on Christmas Eve. Before he goes to bed, his dad reads from John chapter 15 in the Bible. Bobby can't stop thinking about the phrase, "If I had not come," as he drifts off to sleep. Christmas morning he rushes down stairs after hearing a loud voice call his name. But everything is dark, no one is around, and all of the Christmas decorations have disappeared. Bobby leaves his house and begins a journey all around his town to find out what's going on. He wonders why a factory and a local store are open on Christmas day, but no one seems to know what Bobby is talking about. As he continues his journey, he finds that his church, the Children's Home, the hospital, and the shelter are missing. He encounters vacant lots and sign after sign with the words, "If I Had Not Come" written on them. With no where else to turn, he runs home, picks up the Bible, and turns to the book of John, but the entire New Testament is blank except for a faint outline of the words, "If I Had Not Come" on each page. Shocked, all he can think about is a world without Jesus. His thoughts are interrupted by the sound of church bells, and he realizes it was all a terrible dream. He shows his relief and gratitude by thanking Jesus that He did come. ***My family enjoyed the book, and I do think it is tradition worthy! 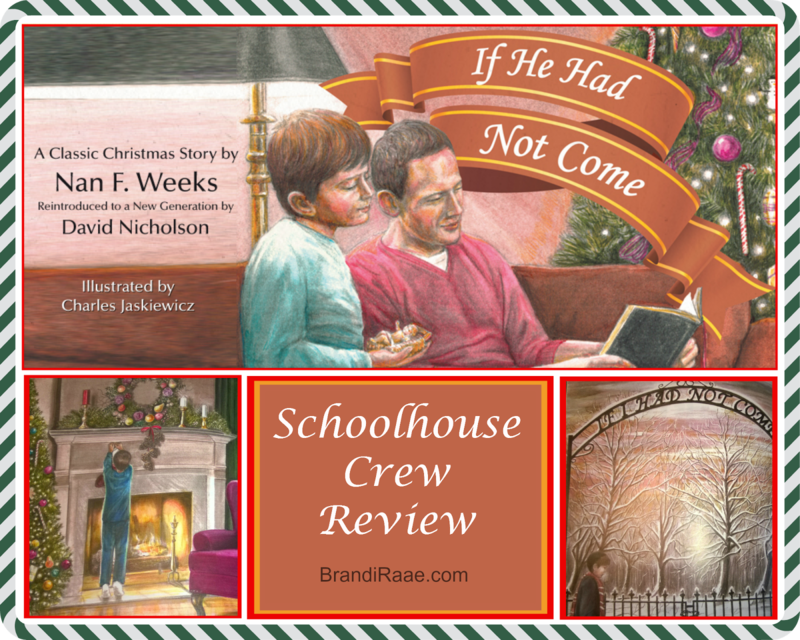 The story is wonderful, and timeless illustrations characterized by soft, muted colors give it that classic Christmas-y feel. My one and only complaint has to do with one of the illustrations. In one corner of a page plastered with "If I Had Not Come" signs there's a scene of a mother grabbing her child's arm and getting ready to spank her. It's not that I am against spanking, but the message it sends is a little confusing. Is the mother spanking her child because Jesus had not come, or is the girl misbehaving because Jesus had not come? My children are old enough to not be confused, but I wonder if younger children could possibly get the wrong idea that they shouldn't ever be spanked by loving parents. I debated whether or not I should even mention this, but my husband agreed that it was a bit strange and could be interpreted the wrong way. I wanted to be on the safe side and mention the picture since it involves a sensitive subject. At the end of the book, there are several discussion questions and activities that families can do together. First, If He Had Not Come Interactive Topics for Families and Sunday School Teachers, provides open-ended questions pertaining to the story and characters such as imagining what it would be like to be in Bobby's place on Christmas morning, talking about why some stores close on Christmas, making a list of other things that would be different if Jesus had not come, and more. 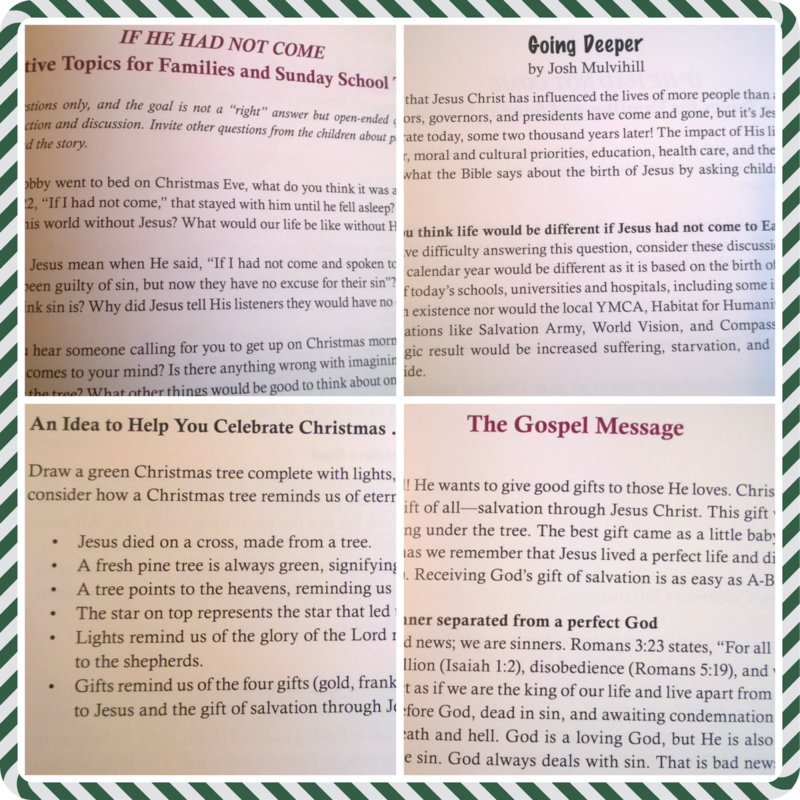 Second, Going Deeper, by pastor, Josh Mulvihill, encourages families to think about how life would be different if Jesus had not come into our world and to search Scripture regarding the birth of Jesus, why He came, and what it would mean for us spiritually if Jesus hadn't been born of a virgin. Several Bible verses are provided for families to look up together. Explanations and Scripture are provided in each step. Following the steps is a prayer you or your child can pray in response to believing Jesus is God's Son and that He died for your sins. Fourth, An Idea to Help You Celebrate Christmas . . ., suggests drawing a fully decorated Christmas tree to remind you of the eternal life we have through Jesus. Six points tell how parts of the tree and decorations symbolize different aspects of the true meaning of Christmas. ***I read If He Had Not Come aloud to all of my kids, and afterward we discussed many of the questions at the end of the book. We talked a lot about what else would be different if Jesus hadn't come. One thing that struck me was that there most likely wouldn't be a Santa Claus. While my children haven't grown up believing in Santa, when they were younger I read a story about the real St. Nicholas every December. So, without the real St. Nicholas who was a Christian known for giving to the poor, we probably wouldn't have the modern Santa either. With so much of what I call "Christmas fluff" out there, I think this book is a real gem. It offers a unique spin on the Christmas story requiring readers to really think about what life would be like without our precious Emmanuel. This book is a treasure you should consider reading to your children this year and every year! Check out what other members of the Schoolhouse Review Crew thought by clicking the banner below.